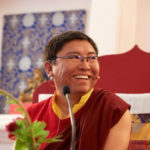 My vision for Yeshe Rangsal is a place where practice and study will be the means for us to become sane human beings. From the ground of basic sanity, deepening our practice in retreat, we develop into accomplished yogis and yoginis on the path to enlightenment. Bodhicitta, the mind of enlightened compassion, lies at the heart of Buddhist teachings. Each one of us has the capacity for this inner liberation, but we need guidance and practice. 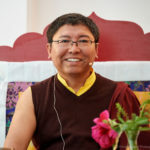 To create a fruitful setting for such Dharma practice, Rinpoche has established the Yeshe Rangsal retreat land as his seat in the West. Yeshe Rangsal is the cornerstone of an expanding mandala of activity in Crestone, Colorado. In addition to annual summer retreats, a month-long retreat from time to time, and weekly practice groups, we envision longer retreat periods, seminars and special teachings. Yeshe Rangsal (self-cognizant wakefulness) lies on Pundarika’s 55 acres of secluded retreat land. The Enlightenment Stupa was built in 2007 and a shrine to Dorje Yudronma (protectress of Yeshe Rangsal) was completed in 2010 and consecrated in 2014. Our long-term vision is that the existing Stupa will be accompanied by a permanent shrine hall (we currently use a seasonal teaching tent). 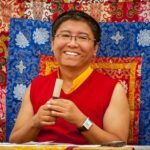 Four retreat places for Rinpoche’s students are now available: Lama House (2 bedrooms) and three completed single cabins (the first cabin built was named “Dharmakaya Cabin” by Rinpoche) in 2018. A retreat support building was completed in the summer of 2013. Lastly, a small and lovely home was purchased for Rinpoche in September 2008, on property bordering the Yeshe Rangsal land.